In full glare of television cameras, Netanyahu’s military forces are mowing down Palestinian demonstrators. As men, women, and children are being killed in cold blood, we are reminded of the crude massacres perpetrated in South Africa during the dark days of apartheid. Whether it was Sharpville or Boipatong, the gruesome murders were as merciless as the ongoing horrors faced by Palestinians yearning for the freedom epitomized in the struggles of Winnie Madikizela-Mandela. In his tribute to the Mother of SA’s struggle, Chris Barron writes: “In their darkest hour, when the apartheid juggernaut seemed unchallengeable and their leaders were doing life or in exile, she was the symbol of defiance”. Truly a giant who has inspired liberation movements across Africa, Asia, Middle East, Europe and the Americas. Ahed Tamimi and the brave Palestinians who dare to defy Israel are cut from the same cloth of resistance. Academic and activist Mazen Qumsiyeh recalls that dozens of massacres were committed during the period leading up to Israel’s creation. “534 villages and towns were depopulated in a bizarre 20th-century attempt to transform a multicultural/multireligious Palestine to become ‘the Jewish state of Israel'”. 70 years later massacres of Palestinians are still being committed. An unending process targeting the children of the soil. A process characterized by the slaughter of innocents whose only crime is that they are Palestinian. Gaza’s protest action dubbed #GreatReturnMarch traces its genesis in Zionism’s original sin: depopulation and dispossession. It tells the story of a people who once enjoyed sovereignty over their entire land but today are confined in open air prisons, sealed off, under siege, facing death for desiring to live as free human beings. Gaza, cut off from rest of Palestine and the world, where a merciless siege by #ApartheidIsrael has been in force for a number of years, is undergoing a slow genocide. And though the world especially Arab neighbors Egypt, Jordan and Saudi Arabia have conspired with Israel to punish Palestinians for refusing to disavow their rights to live as free people enjoying honor and dignity, Gaza said enough is enough. Thousands of protesters have adopted a defiance campaign anchored in their #RightOfReturn. Netanyahu’s army of killers have resorted to their preferred choice of action: massacre. To date, Israeli snipers have murdered dozens and permanently disabled hundreds of peaceful protesters. But the wave upon wave of Palestinians remain determined to offer supreme sacrifices in order to attain freedom. 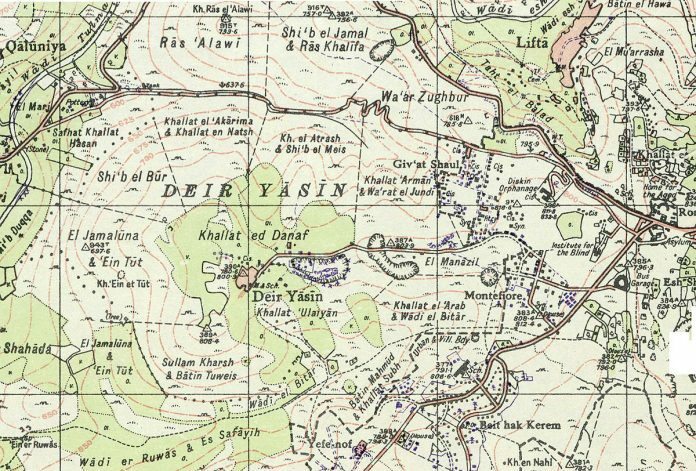 Between the gruesome history of Deir Yassin and the current massacres, Palestinian resistance is at an all-time high.